It’s 8am on a bright, sunny, warm, blue sky Sunday morning and I’m sitting at my desk in the ABR office contemplating the sensitive balance of emotions and practicality that arises when buying a motorcycle. Anyway, it’s now Sunday evening, it’s been a magnificent day in the saddle and the midnight oil is about to take a hammering. It has always been thus. First, let’s set the scene with a bit of history. Royal Enfield likes to tell us that it’s the oldest motorcycle brand in continuous production, and I’m sure I’ll not surprise you when I say the brand originated in the UK, though it is now Indian owned and manufactured. The Indian connection dates from 1955, when the UK company partnered with Madras Motors to form ‘Enfield India’. This trade agreement was to assemble the 350cc Royal Enfield Bullet under licence following a nice little order from the Government of India for 800 machines. The UK company stopped making motorcycles in 1970 and followed the well-worn British engineering path of the day by going bust the following year. Enfield of India, which had by then acquired all the tooling necessary for full production, continued making the Bullet in Madras (now called Chennai). By 1999, and following legal success over ownership of the trademark, Enfield India was branding all its motorcycles ‘Royal Enfield’. Fast forward to 2018 and Royal Enfield claims to be the fastest growing motorcycle brand in the world. It now exports to over 50 countries and sells around 700,000 units per year, with most of these sales in the Indian market. However, recent events tell me the company has ambitious plans to expand its overseas sales, as demonstrated by the acquisition of Harris Performance Parts in the UK and the subsequent set up of an impressive technology centre in Leicestershire. No doubt the launch of the Royal Enfield Himalayan is but one step in the execution of said plan. What most readers will not know is that ABR and Royal Enfield share a tenuous, though somewhat romantic, historical link. The first origins of Royal Enfield company can be traced back to a guy called George Townsend setting up a needle factory in Redditch, Worcestershire in 1851. Adventurize Media (which publishes ABR magazine) was launched by yours truly in 1995 in a small, rented room in a dilapidated building that was once a thriving needle factory in the Enfield district of Redditch. 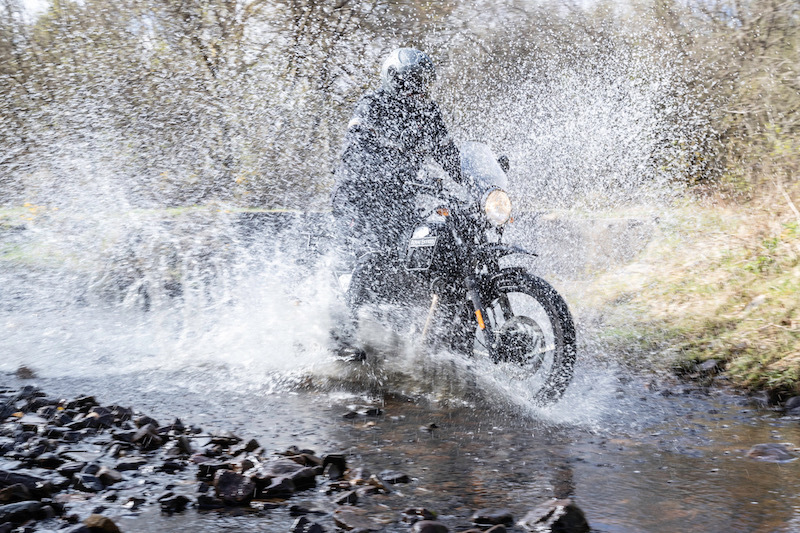 Right, with that out of the way let’s get stuck into the UK launch of the Royal Enfield Himalayan. 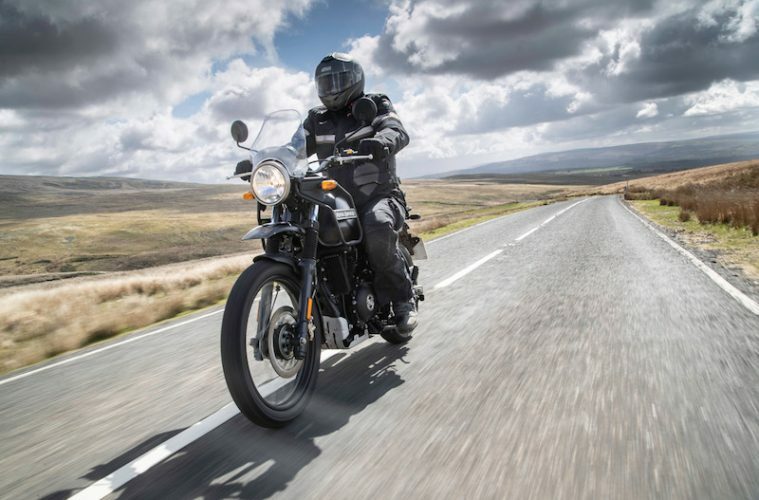 By the time I was travelling down to the Brecon Beacons in South Wales the pre-launch story of the Himalayan already came with enough twists, turns, failed deadlines, updates and modifications to make it into folklore. Indeed, had the Royal Enfield Himalayan been a motorcycle out of Scandinavia I’d be writing a saga. The bike was originally launched in India over two years ago and, due to several faults and quality issues, the company had decided to delay its entry into overseas markets until these problems had been sorted. Nice to know. On the ride down, I had a chance to reminisce over my previous two Royal Enfield experiences. The first I can’t recall in any technical detail, as I was about 14 years old and spent most of the time on the floor in a muddy field with the bike on top of me. The second encounter was a few years ago, when I booked my Yamaha XT660Z Ténéré in for a service and was offered an aging and abused Bullet as a courtesy vehicle for the day. My experience was such that this is the last time I’ll use the words ‘courtesy’ and ‘Bullet’ in the same sentence, as it may hint at a pleasant experience. It would have been more of a courtesy had the garage staff wrestled me to the ground, kicked me in the kidneys and forced me to crawl home. On arrival at the launch venue the first thing that grabbed me about the Himalayan was the looks. I’m not sure what the company set out to achieve here other than what appears to be a mesh of retro charm with a whiff of off-road form, infused with a scent of modern day quality… Oh, and then bolt a screen on it. The result is unique, odd, quirky and would be a surprisingly strong antidote for anyone who reacts badly to lavish, flowing CAD, and for some unknown, emotive reason I really, really like it. Perhaps the appeal lies in the primitive, unevolved lizard section of my brain. Either way, I think you’ll know if a Royal Enfield Himalayan is for you on sight. 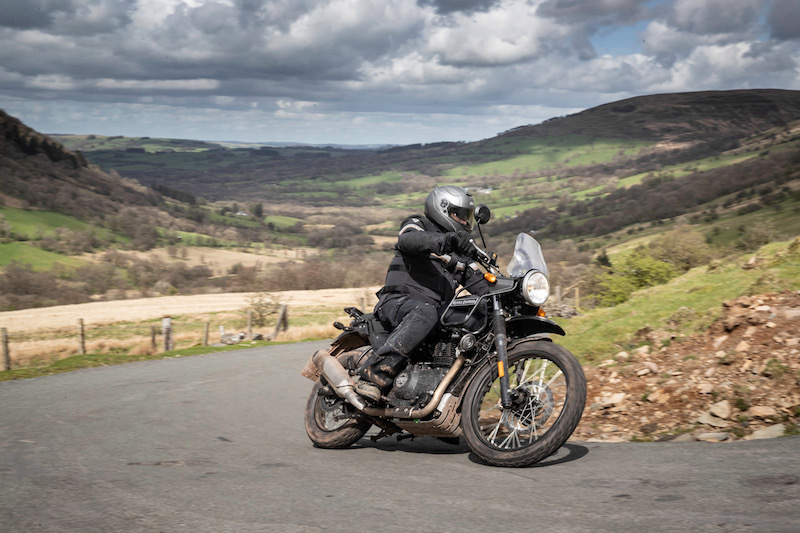 Our test ride would take us on a two-day route focusing on the narrow, gravel strewn potholed single tracks of the Brecon Beacons, plus we’d have the chance to check out the Himalayan off-road on a green lane. As the company pointed out, they were trying to replicate Indian and Himalaya riding conditions. Throwing a leg over the 800mm-high saddle, it was no problem to set both feet flat on the floor with some knee bend in reserve. A quick visual check of the other riders confirmed even the shortest (5ft 6in) could do the same. One of the reasons for this is that a lot of the 200mm suspension travel disappears when under the weight of the rider. At 17st, I’m not exactly Kate Moss, but in my view the suspension is under sprung which results in a ride that was just the wrong side of wallowing on road and came with plenty of bottoming out and undercarriage scraping off-road. I’ll qualify what I just said by stating the suspension was only an issue of note when the bike was ridden at it’s limit and at pace. When handled in a more relaxed style, both on and off-road, as I suspect most buyers will, there’s no real complaint, but I’d still prefer a stronger set up. The ergonomics are very comfortable with the hand, arse, feet triangle offering an upright adventure bike stance, which I like. 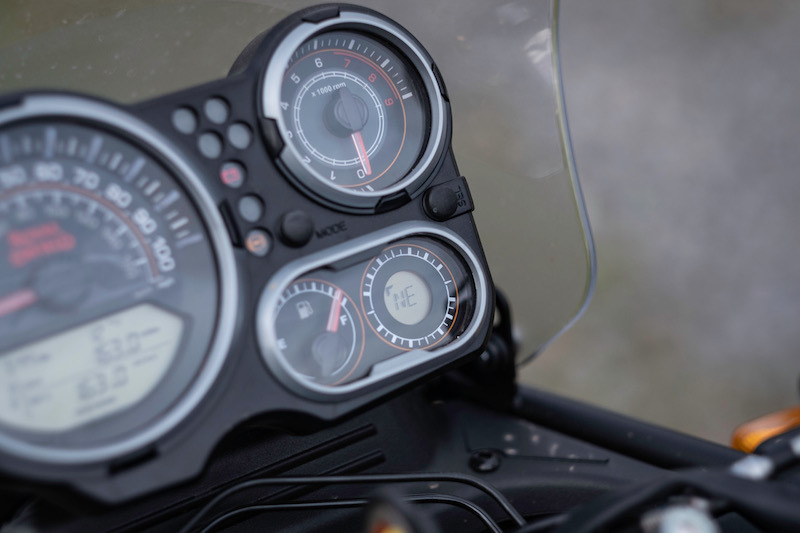 The dash is a combination of analogue and digital and there’s plenty of information including a compass which, in my experience, only ever pointed NE, or maybe all roads in Wales head north east. 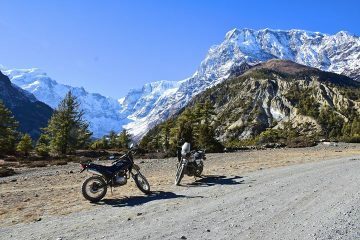 Sitting on the Himalayan it feels like a 250cc, and even though it weighs in at 185kg, it is far more manageable than the Herculean effort required to manhandle some of the larger adventure bikes. This will undoubtedly appeal to a section of potential buyers. The only niggle before setting off was that the mirrors could do with being a bit wider to avoid my shoulders being the main points of rear view. Out on the road, there’s no getting away from the fact that this 411cc single pumps out just 24.5bhp, and if you’re coming from a more powerful machine then you’ll need to change both your expectations and riding style. The Himalayan chugs rather than guns and red lines at 6,500rpm. If you want to travel at any sort of fast pace, then it’s all about maintaining momentum with smooth riding rather than bouts of heavy braking followed by a big handful of throttle. You do feel a few vibrations out on the road, but when you consider this is a single I was expecting a lot more. In fairness, there were not enough vibes to disturb me whatsoever. The gear box is smooth and slick, it never once missed a gear and, not that I’m advising, even clutchless changes are smooth. This bike also comes with a very pleasant exhaust note which hits the sweet spot in not being loud enough to annoy, but aggressive enough to make you know you’re on a motorcycle. Push this bike around corners and the loss of suspension travel under weight comes back into play with the pegs touching down with little in the way of heroics required, and there’s a fair old wiggle if you hit a bump or undulation mid corner. Stay within its limitations and this is a very soothing bike to ride. You just can’t throttle back and expect to tango, but it’s near perfect for calming you down, chilling out and simply enjoying the scenery as you pass through it. There’s just nothing to scare you with the Himalayan, it’s not going to spit you off and you’re not going to do a stoppie either. Speaking of which, the front brakes feel so old and wooden you could probably carbon date them and it takes an excessive amount of squeezing to get anywhere near slowing down. The ABS also feels very much like a version one – not very smooth, but it works. Off-road, I found the Himalayan to be surprisingly capable when trails are taken at a slow to mid pace. Go fast and things get ugly due to the limitations of the suspension and the knock-on effect of low ground clearance. On a bumpy green lane in Wales, I was constantly bottoming out and whacking the belly pan until I slowed things down. 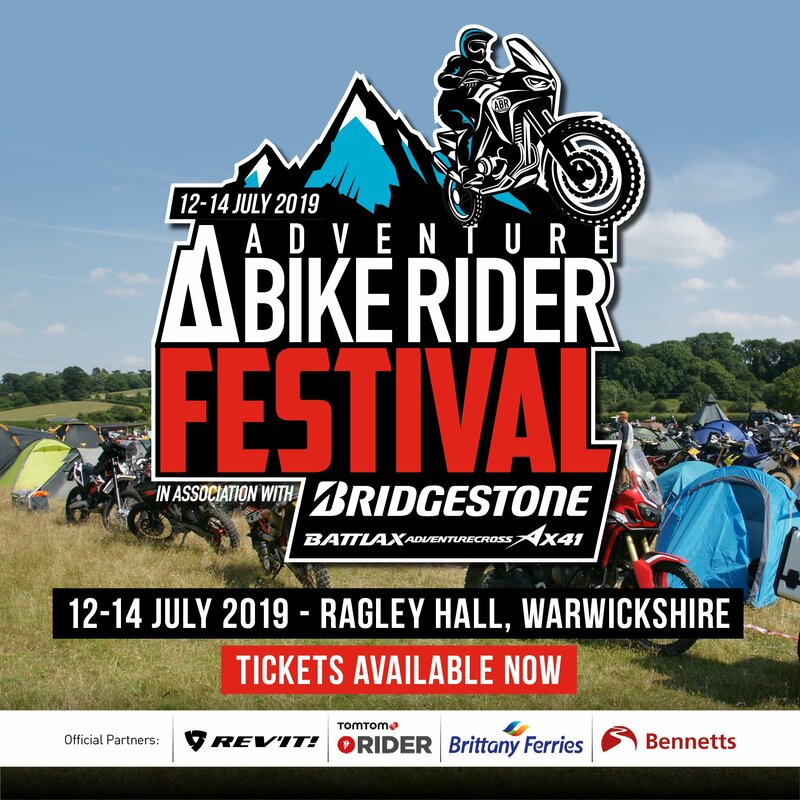 When riding within the limitations of the suspension, it all becomes great fun and the combination of a tractable engine coupled with a well-balanced machine would be very confidence inspiring for anyone intimidated when taking their big capacity adventure bike on off-road trails. The standing up position on the Himalayan is almost perfect out of the box. The footpegs are nice and wide and grippy, bar position spot on but I did find the side panel forces my calves out a little more than I liked. Having said that, I soon got used to it. 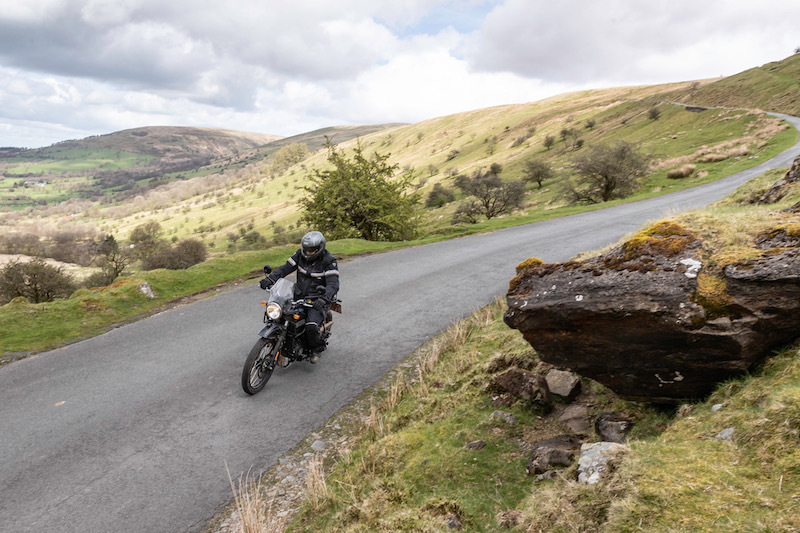 In short, I was impressed with the off-road capability of the Royal Enfield Himalayan and would have liked to have spent far more time checking out the trails in South Wales. If you’re used to riding a more powerful, faster motorcycle then this is a bike that’s going to wear you in. It will force you to ride in a more relaxed manner and if you do get inspired and want to pick up speed then you’ll need to do so smoothly and maintain momentum. I found the Himalayan to be in its element on Welsh single tracks full of farm muck and debris and, as an off-roader, it’s a very tractable and capable machine when trails are taken at leisure rather than pace. At £4,199 it’s competitively priced, and I thoroughly enjoyed my time short time in the saddle, but would I buy one? I’m not ready to downgrade to a 24.5bhp machine as my one and only bike just yet. My wife still enjoys spending time as a pillion and I still value that extra power and speed over the weight penalty of a large machine. However, I would seriously consider the Himalayan as a second bike. It’s quirky enough to make me smile, well suited for short trips across town, very capable for green lane outings and all at a bargain price. I’ve a feeling I’ll be seeing a lot more of these bikes on the road and down the trails very soon. Suspension front: 41mm, 200mm travel. Brakes front: Single 300mm disc ABS. As a commuter: The Royal Enfield Himalayan would make a great bargain-priced, around town commuter. You get 70mpg, good visibility from the upright stance and it’s not excessively heavy for slow speed manoeuvrability. 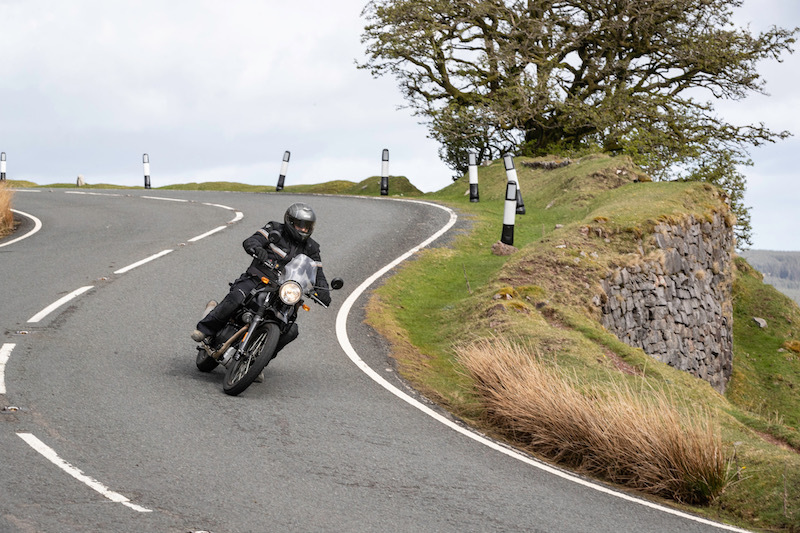 As a weekend tourer: Adjust your riding style and expectations to fit the 24.5bhp on tap and you’re in for a chilled-out tour where it’s more about checking out the scenery than blasting through it. As an off-roader: I’d take the Himalayan most places I’d ride a KTM EXC, only at a lot slower pace. It’s a very capable off-roader as the name and heritage would suggest. As a continental road tourer: If you want a bike capable of doing big miles at a fast pace, then you’ll need to look elsewhere. If time and performance are not issues the Himalayan is a comfortable, bargain priced adventure tourer. 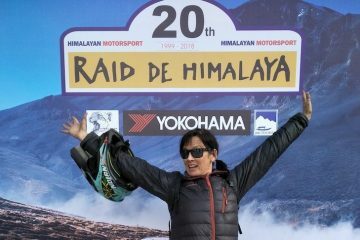 As a RTW overlander: The Royal Enfield Himalayan has the potential to become a cult RTW machine. Economical, simple to work on, capable off-road, and comfortable on road. As a pillion carrier: Yes, you can carry a pillion, but you’ll both suffer over time.